1. For dressing, zest and juice lemon. Combine zest, juice, vinegar, sugar, oil, and poppy seeds in small batter bowl. Whisk until well blended. Cover, refrigerate until ready to use. 2. For salad, preheat oven to 350F. spread almonds in single layer over bottom of small bar pan. Bake 10-12 minutes or until lightly toasted. Remove from oven;coll almonds in bar pan. 3. Hull strawberries; cut into quarters. Score cucumber lengthwise using lemon zester/scorer; remove seeds using corer. Slice cucumbers; cut slices in half. Slice onion into thin wedges (or thin rings). 4. 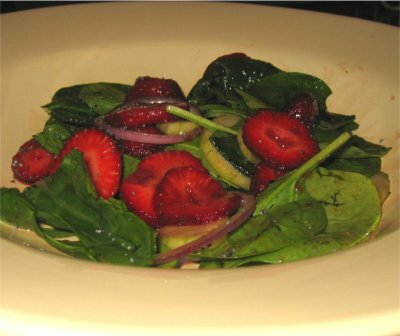 Place spinach in large serving bowl; add strawberries, cucumber, and onion. Whisk dressing; pour over salad, gently tossing to coad using tongs. Sprinkle with almonds. Recipe found in The Pampered Chef Casual Cooking cookbook. This recipe is great on top of toasted baguette slices. It's also good on top of angel hair pasta with a little grated cheese. 1. In large bowl, combine tomatoes, onions, basil, vinegar, oil, garlic, and sugar; stir to mix well. Cover with plastic wrap; let stand at room temperature at least 4 hours. 2a. When sauce ready, in large pot of boiling water, cook pasta 2 minutes, until tender; drain. Transfer pasta to large serving bowl; top with prepared sauce and cheese. Gently toss to mix well. 2b. When sauce ready, slice bread thinly. Spread on olive oil or butter. Broil or toast on stove in large frying pan coated with olive oil. Recipe found in The Weight Watchers Complete Cookbook & Program Basics. This recipe is great for grilling or broiling all sorts of fish, particularly steak or fillet cuts. 1. Prepare marinade in large bowl: Chop garlic, cilantro, basil, and dill. (If you're in a hurry, rough chopping should suffice.) Squeeze lemons and combine juice with olive oil in bowl. Add chopped herbs. 2. Prepare fish: Rub coarse sea salt on the fish. Sprinkle liberal amounts of ground pepper on fish. 3. Marinate fish: Place fish in a large, sealable plastic bag. Pour in marinade and seal bag. (Note that a glass baking dish that accommodates the fish and marinade will also work.) Place in refrigerator for one to two hours, turning over a few times to more evenly expose fish to marinade. 4. Cook fish: Remove fish from marinade and grill or broil. Discard marinade. High temperatures and shorter cooking times work well to seer fish and keep it moist. Fish can be wrapped in foil for cooking to make it moister with less browning on the outside, but this is not really necessary. Recipe from Jennie Hutchison. Thanks Jennie! A delicious, refreshing, aromatic, slightly sweet adult beverage cocktail. Obligatory PSA: Keep in mind that research is revealing that drinking lots of alcohol at once, often referred to as binge drinking, measurably damages the brain after only a few occurances! In other words, the quantity of alcohol consumption determines the amount of harm more than the frequency of drinking. The risks are even higher under the age of 20. So, enjoy in careful moderation if you're 21 or older, otherwise don't drink at all! 1. Prepare sugar-syrup at least 2 hours in advance: In a medium sauce pan over a medium-high heat, combine 4 cups water with the sugar. Bring to a boil stirring until the sugar is dissolved; reduce to a simmer for 15-minutes. Transfer to a glass container and refrigerate until chilled, at least 2 hours. -- Since this step requires advanced planning, it is often inconvenient, but it is worth it as it greatly improves the quality of the mojito! 2. Make the drinks: In the bottom of each glass, divide the mint among the 4 glasses, squeeze the quartered lime in each glass and add 2-3 dashes of bitters. Mash gently with the back of a spoon to bruse the mint leaves and release the flavor. Top the mashed mint mixture with crushed ice. Add 1.5 ounces rum to each glass and fill the remainder of the glass with the sugar syrup. 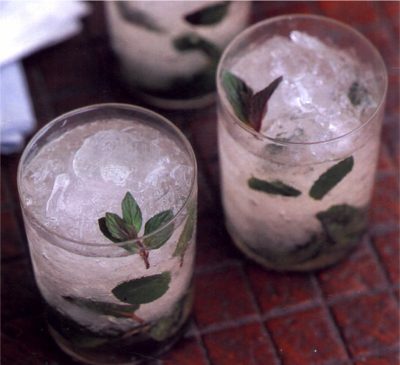 Serve with additional mint leaves. Recipe from Puerto Rican rum advertisement. A flavorful and colorful preparation for a brie cheese wheel. A delicious hors d'oeuvre served with crackers or toasted bread. 1. Place nuts in a 9-inch pie pan and bake in a 350 degree regular or convection oven until golden, 5 to 7 minutes. 2. Meanwhile, chop tomatoes, In a small bowl, mix oil and butter. 3. Cut filo sheets into 12-inch squares. One at a time, brush squares lightly with butter mixture and stack. A simple hardy, smokey delicious bean soup. 1. Sort through beans, discarding any small stones, then rinse under cold running water. Put beans, ham hock, and 2 quarts cold water into a medium, heavy-bottomed pot. Cover and bring to a boil over high heat. Uncover, reduce heat to medium-low and simmer until bean skins are tender and interiors are soft, about 1 hour. 2. Meanwhile, melt butter in a medium skillet over medium heat. Add onions and cook, stirring frequently with a wooden spoon, until soft and just beginning to brown, 3-5 minutes. Remove skillet from heat and set aside. 3. When beans are cooked, reduce heat to low and stir in the onions. Retrieve ham hock from pot and set aside until cool enough to handle. Remove and discard skin, bone, and excess fat, dice meat, and add to soup. Mash some of the beans against the side of the pot with the back of the spoon to make soup a little thicker and a bit creamy, then season to taste with salt and pepper. Recipe from US Senate kitchen via Saveur Magazine (no. 53). Best chicken curry sandwich ever! 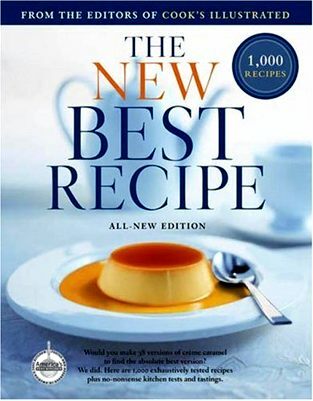 Recipe from Oprah Magazine, November 2004 (pg. 146). Another great recommendation from Jennie Hutchison! What would we do without her?